I woke up missing Caleb this morning. These things are probably related. We used to be a family, and I miss that. And I wanted to call him and tell him that I missed him, but I didn’t. I didn’t do that because there was no point, and because I’m certain he doesn’t miss me, and because he doesn’t deserve my nostalgia, and because he doesn’t deserve my love. I told my mom that I woke up missing Caleb, and she came over and hugged me, which was unexpected because she’s not a hugger, but I appreciated her solace. It made me feel cared for. Then, I started to complain about him. I started to complain about how much he had hurt me, and how hard things were, and she stopped comforting me and started lecturing me instead. She didn’t mean to lecture. She only wants to help, but she doesn’t like my anger. No one likes my anger. I am not allowed my anger. I am only allowed my sadness. My father is still Facebook friends with my ex-husband. I am no longer Facebook friends with my father. This is petty, I know, but I took a stand. I un-friended everyone on Facebook who was friends with Caleb. It wasn’t personal. It wasn’t because I didn’t like them. Most of them are people with whom I only had marginal contact anyway. This is evidenced by the fact that I really haven’t noticed the absence of their stories in my feed. But I needed to take that stand. It was painful for me to see him “liking” their posts. It was painful for me to see them having conversations with him. It was painful for me to see his name again and again and again. It was painful for me to feel that my suffering meant nothing to these people. It was painful for me to realize that all of us are alone in our pain, that only I can feel this pain, no one else can feel it for me, because if they did, they would not want to be “friends” with the man who slammed his fist into my head, over and over again. But I am not allowed to say this. I am not allowed to say “You shouldn’t want to be friends with the man who abused me.” I am not allowed to say that because that would make me sound angry. And I am not allowed my anger. I see a woman on Facebook expressing a lot of rage at her abuser. It is the focus of most of her posts. I am jealous of her. I am jealous of her ability to be angry. I am jealous of her strength. I am jealous that she doesn’t capitulate to the narrative of “victim as survivor” where the victim’s role is only to uplift, to show what’s possible in the wake of abuse. I am jealous of her, but I will not do the same thing. I have had my own expressions of anger on Facebook, but not to that degree. I have not expressed my anger in that way because I am a good girl. I am always a good girl. I am a very good girl, and good girls don’t get to be angry. I am tired of being a good girl. I see that woman’s posts, and I know how she feels. I used to have that kind of anger. It ate me up inside. It tried to claw its way out of me. There were nights when I ran in the dark. I ran so hard and so fast that my chest felt as though it would explode because that pain was the only thing that took away the anger. The running was my way of self-harming, of punishing myself for my anger. I am no longer angry like that. I am rarely angry like that. And this is something to be thankful for. I am not often angry at him. I am not often angry at his friends. I am not often angry at the world. Life has been good to me since leaving him, and I no longer feel hopeless, so I no longer feel angry. But I do still miss him at times, and I am jealous that he has a girlfriend. I am not jealous that he is with someone else. I am not jealous that she is with him. I have no desire to be with him any longer, but I am jealous that, for now, she gets to be with the Caleb I fell in love with. That Caleb is so charming, so kind. I spent years trying to get that Caleb back, wishing for that Caleb to return. 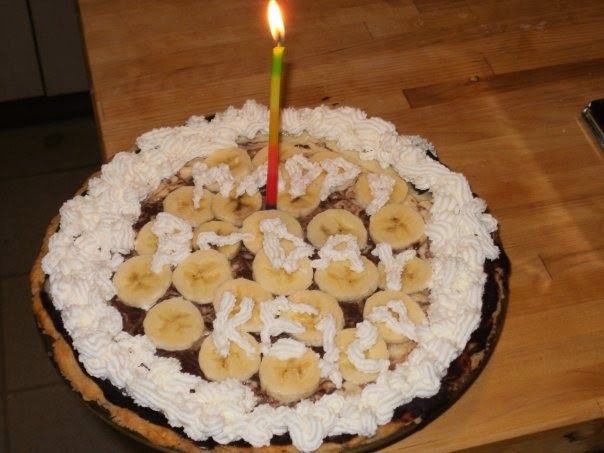 That Caleb let me pick out the fanciest, most elaborate birthday cake I wanted, and then, he made it for me. That Caleb treated me like I was the most special woman in the world. That Caleb has been dead to me for a long time, but for a period, this new girlfriend gets to have that Caleb, and I envy her that. I envy her that, while also pitying her. I pity her because she will fall in love with that Caleb, and I know how deeply that love can go, but also how disappointed she will be in the end. Truthfully, Christmas was always a stressful time when we were married. We almost always fought on Christmas. I have more terrible memories of Christmas than I do good ones. There was the year that my best friend secretly collected money from our friends for my birthday. Caleb and I were going to be staying at my sister-in-law’s on Christmas, and my friend wanted me to have something more special than that. She told everyone how hard it was for me to have a birthday on Christmas. She said that she wanted to collect enough money for us to stay in the fanciest hotel in town. She collected a large sum of money. It was one of the most thoughtful and loving things that anyone has ever done for me. But it angered Caleb. It angered him because he thought I had been complaining about having to stay at his sister’s. I had only mentioned it to my friend, but Caleb thought I had been complaining, and he raged at me on Christmas Eve. He raged at me, and he beat me. It was one of the first times he beat me, and I was shocked. It was Christmas Eve, and I thought, “I am going to have to leave this man. He just beat me,” But by the next morning, he was apologetic, and then, soon, I felt guilty. Maybe I had complained too much, I thought. Maybe I had embarrassed him, I thought. Maybe I had made him feel shame, I thought. It was my fault, I thought. So we drove to his parents’ house, and I wore long sleeves and hoped they didn’t notice how puffy my eyes were from crying. I’ll never have a Christmas like that again. That is something to be thankful for. There is much to be thankful for right now. But that doesn’t change the fact that I miss him sometimes, that I forget these terrible things for the briefest of moments and, instead, I remember playing Christmas Carols and dancing in front of the Christmas tree. I remember envisioning a future with him where we could have a Christmas without misery. I don’t get to have the solace of that dream now. That dream is gone. There was a man who I met this summer. We talked for months. We got to know each other, and right before summer ended, we started a romance. It was all rather impulsive and irresponsible. We don’t live in the same state, and that is not going to change. But it happened. It happened, and I really fell for him, and two nights before I left for the summer, he stayed the night with me. It was the first time I had slept in the same bed with someone since I had left Caleb. In the middle of the night, I rolled over, and I accidentally woke him, and I said, “Sorry, honey.” And then I was embarrassed, and I apologized sleepily. I have no idea why I apologized, but I said “I used to call my husband, ‘honey’.” And this man just took my head and tucked it into his chest to silence me, and I fell back asleep, and I slept so soundly, and so peacefully, and it was beautiful. And when I arrived at the house yesterday, I took my suitcase into this room, and I saw the bed where I had slept with that man, and I was hit with a profound sense of loss. I was hit with the awareness that everything comes with a price, that my decision to pursue my PhD means I don’t have the flexibility to be in a relationship with this man, that having primary custody of my son makes dating extremely hard and complicated, that leaving my abusive husband came with a host of other problems. There are always trade-offs, and I don’t want trade-offs. I want it all. I am selfish with want. It is not lost upon me that, while my life has gotten vastly more complicated, Caleb’s has gotten easier. He gets to have a girlfriend. He gets to go to bars like a twenty-something. He no longer has to take care of a sick child, or get up in the mornings. He has more time and money. His life is carefree, and I resent this sometimes. But on days like this Christmas Eve when I wake up missing him, even on days like this, I still know that I am better off without him. I still know that my complications are part of my beauty, that my PhD program, and my son, and my writing, and my career have trade-offs, but I am in charge of the decision making. I am the one in control, and that is something to be thankful for.